Elin Sian Blake - No news (Dim newyddion) - Online gallery supplying original fine art. Trending Modern British and Contemporary Welsh. Available for sale from Big Sky Fine Art; this original oil painting by Elin Sian Blake, dating from 2016.<br> The painting is supplied in a hand painted wooden contemporary frame.<br> <br> Elin Sian comes originally from Pontypridd, and graduated in Graphic Design from the University of Glamorgan in 2002. Having subsequently spent several years living on the road in vintage vehicles she began painting the scenes and characters she encountered on her travels.<br> <br> She settled in Abergavenny in 2008, and became established as a professional artist, making her name in the equestrian art world as a painter of Welsh cobs. In addition to Welsh imagery and landscapes she had a very successful exhibition in 2013 painting the heroes of the Welsh rugby team past and present, The exhibition was attended by Leigh Halfpenny, Alex Cuthbert, Jamie Roberts and Max Boyce to name but a few. <br> <br> Elin’s work is held in collections across Europe, the U.S and Australia, and in private and public collections in Britain. <br> <br> Her more recent work explores her heritage of the Welsh valleys, and a historical social commentary of everyday Welsh working life.<br> <br> Elin’s work has won several national awards, the most recent being the St Ives School of Painting award at the Artist of the Year competition in the Mall Galleries 2015. She has exhibited widely both locally and in London. 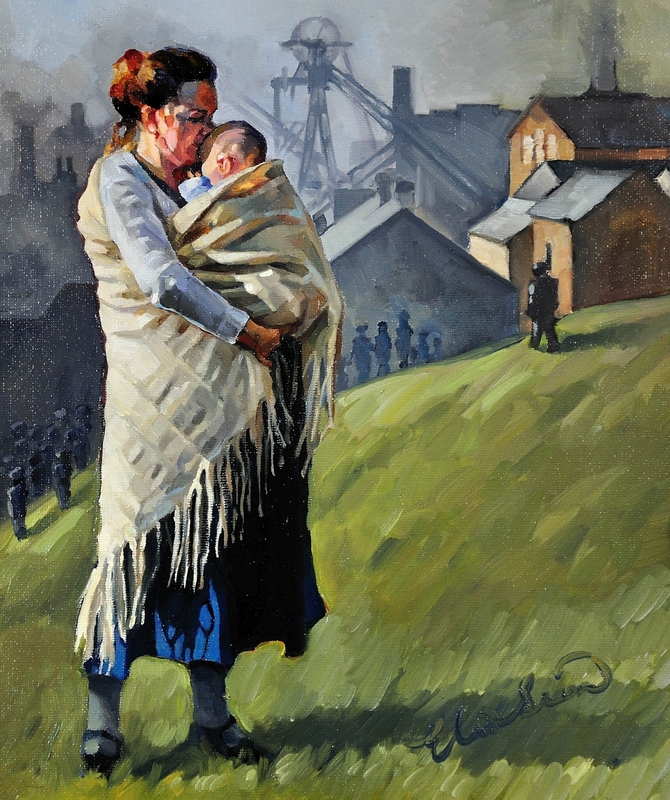 <br> Elin currently works from her studio in Abergavenny, Monmouthshire where she also teaches art to children and adults.<br> <br> This is an nostalgic and moving scene of a woman waiting for news of her husband at the pithead of a Welsh coal mine. She is dressed in a long blue skirt and plain top and carries her small baby clutched to her chest. A cream blanket is wrapped around her shoulders and over the baby, binding them together, keeping the child safe and warm. Her brown hair is swept up in a casual bun on top of her head. She nuzzles the baby’s head, in an intimate and loving way. She is standing on a grass covered mound with the red brick buildings of the mine in the background, and the winding gear of the pithead, beyond that, grey and dirty, dominating the landscape. A crowd of other figures is silhouetted in the background, but we focus only on the anguish of the mother and child. This could be any one of a dozen pit tragedies, or it could be an hour of concern and uncertainty that turns into relief and joy. What we know for sure is that this is a gripping image of two lives put on hold, as they wait for news of another.<br> <br> Merch yn wreiddiol o Bontypridd, graddiodd Elin Sian yn 2002 gyda chymhwyster Dylunio Graffeg o Goleg Morgannwg. Wedi treulio rhai blynyddoedd yn byw ar yr heol mewn carafannau a cherbydau tras dechreuodd hi i baentio’r golygfeydd a chymeriadau y cwrddodd hi a nhw ar ei chrwydrau.<br> Wedi setlo yn y Fenni yn 2008 ymsefydlodd Elin fel artist proffesiynol, yn gwneud enw iddi hi ei hun yn y byd ceffylau, yn paentio cobiau a merlod Cymraeg. Yn ogystal a thirluniau a golygfeydd, cafodd hi arddangosfa llwyddianus iawn yn 2013 pan beintiodd hi arwyr tim rygbi Cymru trwy’r cenhedlaethau. Mynychwyd ei harddangosfa gan Leigh Halfpenny, Alex Cuthbert, Jamie Roberts a Max Boyce ymhlith eraill.<br> Mae hi wedi enill dau gystadlaeaeth agored genedlaethol, ac wedi arddangos yn Llundain ac yn lleol yn Sir Fynwy.<br> <br> Mae ei gwaith diweddaraf yn archwilio ei hetifeddiaeth yn y Cymoedd, a gohebiaeth cymdeithasol o fywyd Gwaith pob dydd yng Nghymru gynt.<br> <br> Mae ei gwaith celf mewn casgliadau ar draws Ewrop, yr Unol Daleithau ac Awstralia, yn ogystal a chasgliadau preifat a chyhoeddus ym Mhrydain.<br> <br> Eisioes mae Elin yn gweithio o’i stiwdio yn y Fenni, ble mae hi hefyd yn dysgu dosbarthiadau celf i blant ac oedolion. Available for sale from Big Sky Fine Art; this original oil painting by Elin Sian Blake, dating from 2016. The painting is supplied in a hand painted wooden contemporary frame. This is an nostalgic and moving scene of a woman waiting for news of her husband at the pithead of a Welsh coal mine. She is dressed in a long blue skirt and plain top and carries her small baby clutched to her chest. A cream blanket is wrapped around her shoulders and over the baby, binding them together, keeping the child safe and warm. Her brown hair is swept up in a casual bun on top of her head. She nuzzles the baby’s head, in an intimate and loving way. She is standing on a grass covered mound with the red brick buildings of the mine in the background, and the winding gear of the pithead, beyond that, grey and dirty, dominating the landscape. A crowd of other figures is silhouetted in the background, but we focus only on the anguish of the mother and child. This could be any one of a dozen pit tragedies, or it could be an hour of concern and uncertainty that turns into relief and joy. What we know for sure is that this is a gripping image of two lives put on hold, as they wait for news of another.